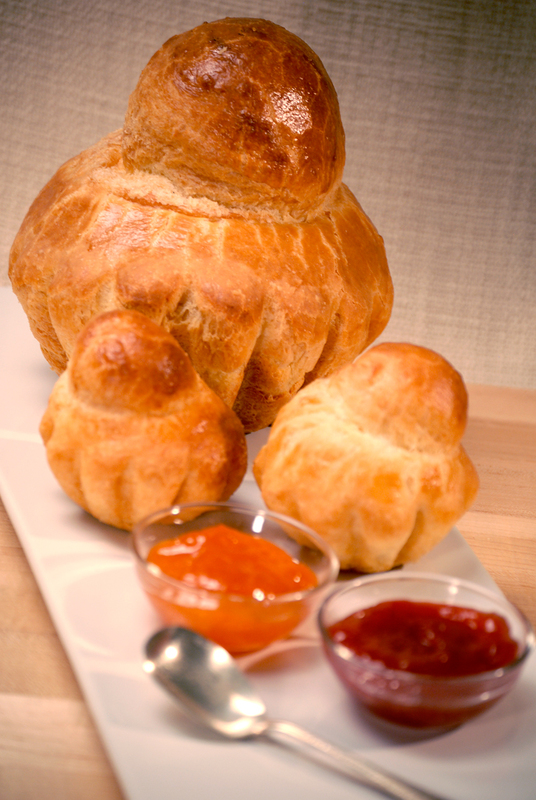 Brioches are buttery, moist, light breads made with a yeast dough. The perfect accompaniment to a café au lait in the morning, brioche can be made as a large loaf or small individual ones. The dough is also ideal for encasing sausage or pâté. A food processor and yields excellent results. If possible, make the dough the day before you plan to use it — it will be more malleable after it has rested overnight. FOR THE DOUGH: Combine the yeast, warm water, and sugar in a food processor. Let stand for 10 to 15 minutes, until bubbly. Add the salt, eggs, and flour to the yeast mixture and process for about 30 seconds. With the machine running, add the butter in chunks, and process for another 15 to 20 seconds. Transfer the dough to a bowl, cover with plastic wrap, and let rise in a warm, draft-free place (about 70 degrees) for 1 1/2 to 2 hours until it has doubled in bulk. If making small brioches, butter twelve individual brioche molds; if making one large brioche, butter a 9-by-9-inch loaf pan or large brioche mold. For little brioches, cut the dough into 12 pieces (about 2 1/2 ounces per brioche) and roll into little balls. Place in the buttered brioche molds. Brush with the egg wash and let rise in a warm, draft-free place for 1 1/4 to 1 1/2 hours, or until doubled. For a large brioche, put the dough in the buttered pan. Brush with the egg wash and let rise for about 3 hours, until almost doubled. Bake individual brioches for about 25 minutes, the large brioche for about 45 minutes, until puffed and beautifully browned. Unmold and cool on a rack. I tried this recipe four times this past weekend without success. It just does not work! I was very careful to follow the procedure presented in this episode, but the recipe appears to be very short on flour. I plan to try again next weekend and significantly increase the quantity of flour. Has anyone been successful with this recipe??? Like you I tried several times without success. I would like to have Chef’ Pepin’s input. Wish I had read the previous comments before I attempted this recipe. Plus why has a reply NOT been posted on this issue. I also wasted these ingredients as this recipe is NOT possible !!!!! I like the video version better however the way Mr. Pepin makes is not exactly the way is given in the reading instructions. which is confusing. He makes with the food processor. 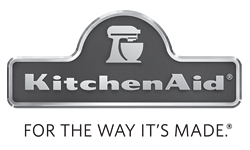 Can you make it in another type of appliance? You have given me a wonderful new way to cook delicious and fast meals – your recipes are easy to follow and always come out perfect. What a fun show when Claudine is on – she has a trillion dollar smile!! dough down, and put in a refrigerate. batter down. Could you give some advise. Wow, this recipe is off, way too little flour to the amount of everything else. Add at least another cup of flour. I added more liquid and more yeast, too. I’m still not sure it’s enough to save, it though. I just tried it. I, too, made it at night and let it rise about 2 hours before pushing it down and wrapping it in plastic wrap before putting it in the fridge. It proofed quite well and was practically pushing through the plastic wrap. It proofed again for an hour and a half before I brushed it and baked it. I caught little bits when they were cooling and tasted it. It seemed fine and like it would be delicious with butter and jam.